The Aztec Empire was established in 1428 as a result of a civil war between the Mexica people and the people from other city-states. The city-state of the Mexica people, Tenochtitlan, forged a military alliance with two other city-states. This was called the Triple Alliance and culminated in the establishment of the Aztec Empire. The Aztec Emperor was the most powerful individual in the empire since he held not only the political power but also the religious power. The emperor was always a male since women were not allowed to hold political office. The history of the Aztec Emperor, of course, begins with the establishment of the Aztec Empire in 1428. The empire emerged from the civil war that followed the death of the Tepanec king Tezozomoc in 1426. The Aztec king at the time was Itzcoatl under whose leadership the Aztecs emerged victors from the civil war with the aid of two other city-states of Texcoco and Tlacopan. Thus Itzcoatl went on to become the first of the Aztec emperor, ruling from the city-state of Tenochtitlan. Aztec emperors were the most powerful individuals in the empire and the ultimate authority in all important decisions. The emperors were not only political figureheads but also the supreme religious authority since they were considered descendants of gods. An Aztec Emperors status was not very different from the European emperors or kings of the time. They decided the tribute that was to be exacted from the subjugated city-state and also made decisions on matters of war and peace. Duties of the emperors included ensuring the stability of the empire by whichever means they thought appropriate. Just like other matters of the state, Aztec emperors were the final authority for matters of military significance and wars. It was the emperors who decided when to go to war and who the enemy were. It was also the emperors who decided the amount and method of the tribute to be extracted from the defeated city-state or tribe. Aztec emperors could nominate or remove the generals of their armies on their discretion. Religion was very important for Aztec emperors since it provided legitimacy to their rule. They in turn ensured that the priestly class remained satisfied. The emperors were considered the descendants of the gods and thus ruled by divine right. On the other hand, the emperors made sure that religious ceremonies were held without any restrictions and that steady supply of war captives was available for human sacrifice. For this purpose, they constantly waged wars with the neighbouring city-states and tribes. Aztec emperors also actively took part in religious festivals and ceremonies. The first and one of the most famous Aztec emperors was Itzcoatl who ascended to the throne in 1427 amidst the ongoing civil war for supremacy between different city-states. He became the emperor of the Aztec Empire in 1428 and ruled until his death in 1440. 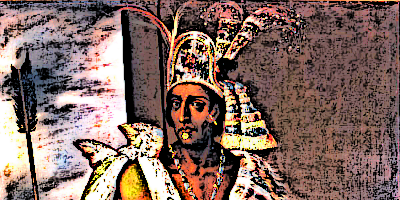 After his death, Moctezuma I became the emperor and ruled the empire till 1469. Perhaps the most well known Aztec emperor for a modern reader is Cuauhtemoc who became emperor on the eve of the Spanish invasion in 1421. He was eventually captured and executed by the men of Spanish conquistador, Hernan Cortes. Aztec emperors between Moctezuma I and Cuauhtemoc included Axayacatl, Tizoc, Ahuitzotl, Moctezuma II, and Cuitlahuac. Aztec emperors lived in grand palaces adored with gardens, zoos, aquariums, parios, and large courtyards. The palace normally covered an area of 50,000 square meters and could have as many as 100 baths. The palace included many rooms used by the officials of the government for administrative purposes on one side and residential quarters on the other side. It was called “lord’s-place house” and indeed every bit of the palace reflected the magnificence of the lord of the empire. Other than the residential and administrative quarters, there were large gardens, courtyards, and zoos. For instance, the palace of Aztec Emperor Moctezuma II included two different zoos for different kinds of animals, a large aquarium, and a botanical garden. Hundreds of people were employed just to keep the palace in proper shape. Aztec emperors made use of lavish and adorned clothing. A lot of components of this clothing were exclusively reserved for the emperors and could not be used by other people. Perhaps the most distinguishing feature of the clothing of Aztec emperors was their headdresses which were used for ordinary as well as ceremonial clothing. These headdresses were made of exquisite gold-green feathers of Quetzal. Quetzals were raised specially in order to get the feathers for the clothing of Aztec emperors and the nobility. Various materials were used for decoration of the clothing of Aztec emperors, including pedants, feathers, and furs. Lavish use of gold was also made for the clothing of Aztec emperors in the form of necklaces, earrings, and bracelets. Ceremonial clothing also included elaborate masks of different kinds. Since Aztec emperors were considered descendants of gods, rituals and ceremonies were enacted upon their death. However, not much is known about the funeral rites of the Aztec emperors. Information from the archaeological discoveries suggests that the Aztec Emperor Ahuizotl was cremated on a funeral pyre in 1502. His funerary rights are described in a manuscript called the Codex Duran. In these manuscripts the dead emperor is represented as a fearful mythological creature that trapped men for the rain god Tlaloc. Cremation was an important funeral rite and it was also common to sacrifice slaves when an emperor died. Aztec emperors were the supreme rulers of the land and also the ultimate religious authority because of the belief that they were descendants of gods. The emperors lived in grand palaces and enjoyed a lavish lifestyle. The clothing reserved for the emperors was not allowed for the common people and included the beautiful feather of Quetzal. The emperors were the final authority in all matters including the decision to wage war and the tribute to be extracted from the subjugated city-state. Elaborate funeral rites and ceremonies were performed upon the death of Aztec emperors.